Detroit Red Wings rookie goaler Roger Crozier earned his third shutout in only four games last night as he and his mates blanked the hapless Boston Bruins 2-0 at the Olympia in Detroit. It was the only scheduled National Hockey League game. The victory moves the Red Wings into a tie for first place in the NHL standings. Boston, meanwhile, is at the other end of the spectrum, sporting an 0-7-1 record with little hope for improvement on the horizon. 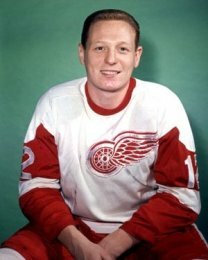 Bruce MacGregor was the offensive star for the Wings, scoring the only two goals that the game would produce. He counted twice in the second period with each coming off a rebound. He scored his first while the teams were playing four aside. Eddie Joyal’s shot was stopped by Bruins’ backstop Ed Johnston, who kicked the rebound right to MacGregor. Bruce made no mistake and fired the puck right back past Johnston to give the Wings the 1-0 lead at the 8:37 mark. About eight minutes later, the Red Wings were attempting to kill off a Bruins’ power play when Normie Ullman grabbed a loose puck and sent MacGregor off up the middle with a perfect pass. The redheaded right winger was stopped on his initial try, but Bruce grabbed the rebound and made good on the second chance. The goals for MacGregor were his first points this season. Red Wings’ coach Sid Abel was happy to see MacGregor get the monkey off his back with the goals. He would like to see more points from the younger players on his team. Crozier has allowed just one goal over the past four games, and that was a power play marker by Montreal on Saturday. In fifteen games with Detroit last season, he picked up a total of two shutouts. In the two OHA Junior A games played last evening, Montreal Canadiens farm clubs were both victorious. The Montreal Junior Canadiens skated to an easy 5-1 win over the Hamilton Red Wings, while the Peterborough Petes doubled the count on the St. Catharines Black Hawks 4-2. In Hamilton, Jacques Lemaire was the scoring hero for the Junior Habs with two goals. Singletons came off the sticks of Carol Vadnais, Craig Patrick and Guy Dufour. Jimmy Peters, with a first period tally, was the lone Hamilton goal-getter. Andre Lacroix scored a pair of goals, one on a penalty shot, to lead Peterborough to a 4-2 home ice win over St. Catharines. Leo Thiffault and Danny Grant also scored for the Petes. St. Catharines marksmen were Doug Shelton and Bill Carson. Toronto Maple Leafs winger Dickie Moore won’t play games this weekend against Chicago and Detroit. Leafs’ coach Imlach says he wants Moore to take his time and get back to full strength before trying to continue his comeback. Chicago has sent Alain Caron to St. Louis of the CPHL. Sid Abel insists he was never interested in Gump Worsley as a backup plan in case Roger Crozier couldn’t cut it, but he did say this week he would gladly take Jacques Plante off the Rangers’ hands if they were to make Jake the Snake available. Jack Evans, who was player coach last season of the AHL’s Buffalo Bisons, has been named captain of the Los Angeles Blades of the WHL. 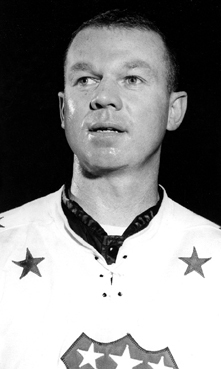 Rochester (AHL) defenceman Don Cherry has been out since injuring a knee in a pre-season game. He will resume skating today and should be available some time next week for duty. With Cherry’s impending return, the Americans have sent rookie Ray Dupont to Tulsa of the CPHL. The United States national hockey team program has named Ken Yackel as coach and Cal Marvin as general manager.